We celebrated my son's 10th birthday day with a Minecraft Party a few weeks ago! Minecraft is actually a great party theme for tweens- its a game that most of them already play and love- you can ask invited guests to bring over their iPad (if they have one) so that the kids can play together by signing into the same server- or you can play Minecraft on an XBox in multi-player mode. My boys had fun setting up a virtual “party world” ahead of time and thought through some challenges that they could all play together (who can build the “coolest” house in 20 minutes, who can “destroy” the houses in the craziest way, who can hide the longest, etc). And I loved that they took over most of the party planning, leaving me to focus on the food and the favors! We offered a pasta and salad bar for dinner followed by this easy homemade Creeper Cake for dessert! I like to make homemade birthday cakes for my kids- because bakery cakes can easily cost $50 or more for a cake that feeds 15 people- plus I honestly think that most homemade cakes taste better than anything purchased in a store! And I like to keep my cakes fairly simple- having figured out quite some time ago that it is just not worth spending hours and hours decorating a cake to perfection when 5 minutes after singing “Happy Birthday” it is completely destroyed. 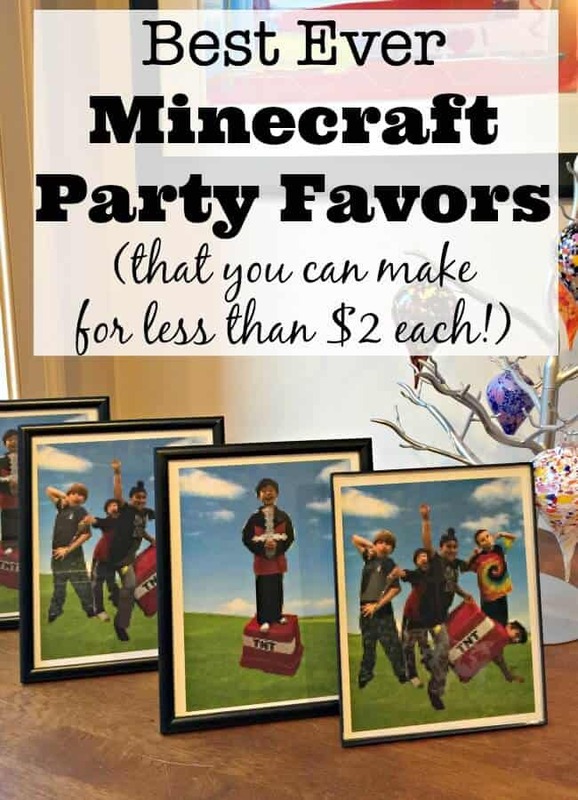 And many of the guests ask for a generous helping only to take 2 bites and then move on to whatever exciting thing is next on our party activity list! So if I can create a fun birthday party cake that delights my child in under an hour's time (not including baking and cooling time)- that's perfect! 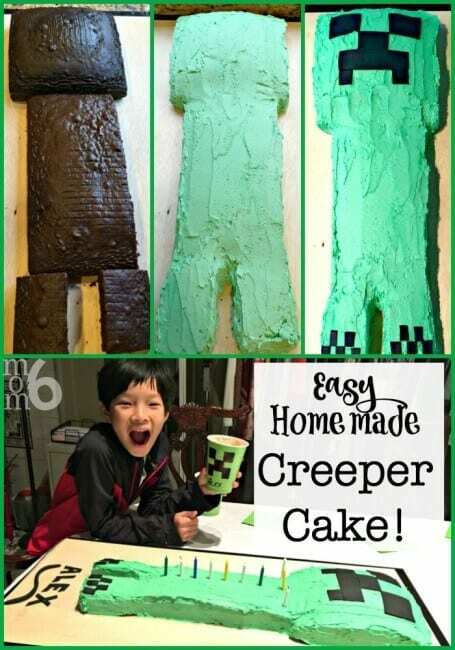 Here's how I did just that- with my easy homemade Creeper Cake! 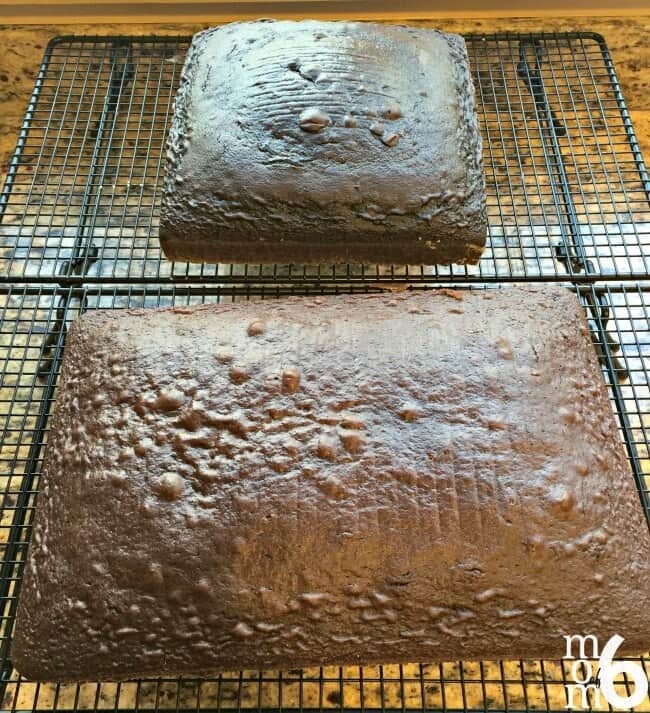 If you have a favorite homemade cake recipe- go for it! 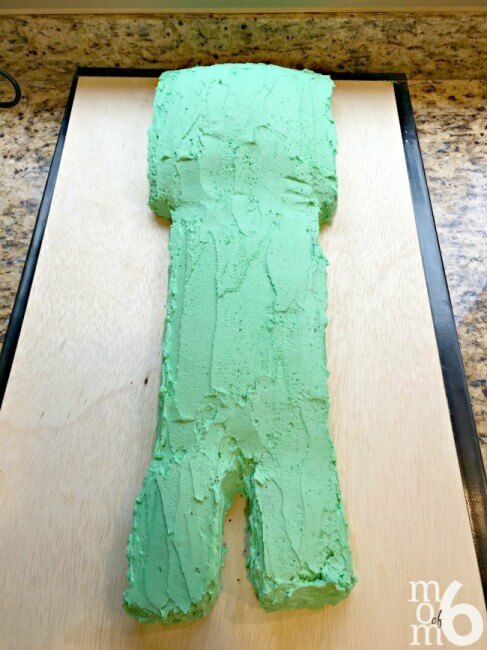 I have several, but often for birthday cakes I will just use a store bought cake mix. Bake one cake in a 13×9″ pan and the other in a 8 or 9″ square pan (I love Wilton non-stick pans for my cakes.) 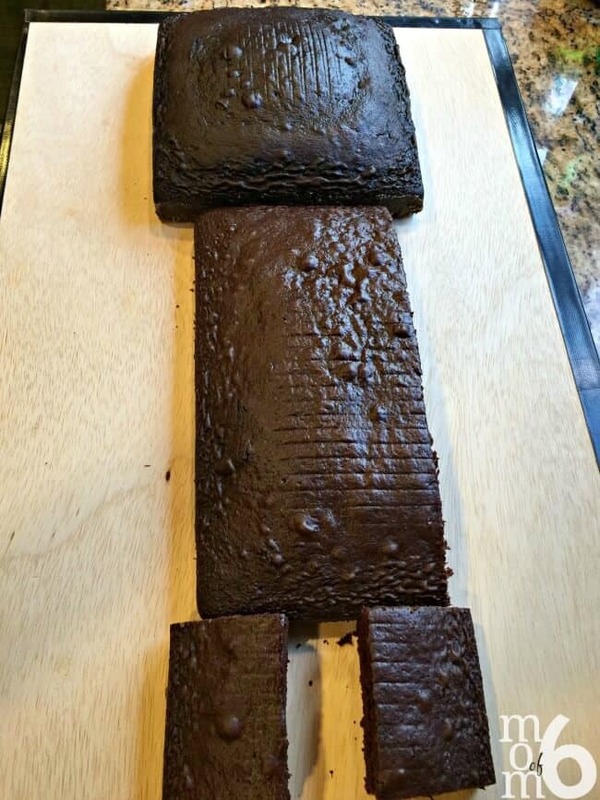 Yes, the cake baked in the square pan will be taller than the other cake- you can choose to not fill the pan with all of the cake batter for the second mix, you can choose to trim the cake to size after it cools, or you can choose to just allow it to be larger (which is what I did). The first thing you'll want to do is to cut your 13×9″ cake lengthwise into two sections, about 2/3 and 1/3 of the size of the cake. Then take your 1/3 section and cut two pieces of the same length (about 4-5″ long). 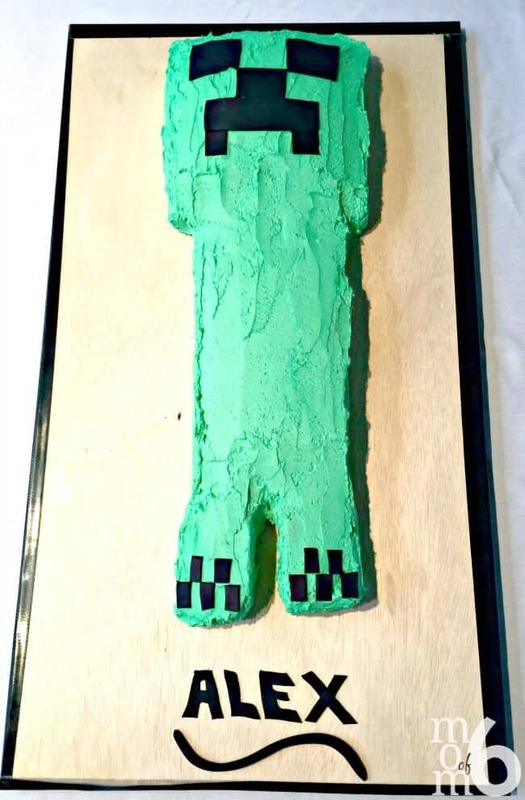 On a cake board (we use a piece of wood with the ends covered in duck tape to avoid splinters but you can also use cardboard cake boards), assemble your creeper cake by placing the square cake at the top, the long body piece centered in the middle (your 2/3 section of your larger cake) and the two smaller 4″ sections for feet at the bottom. Wipe away any cake crumbs that fall onto the board. 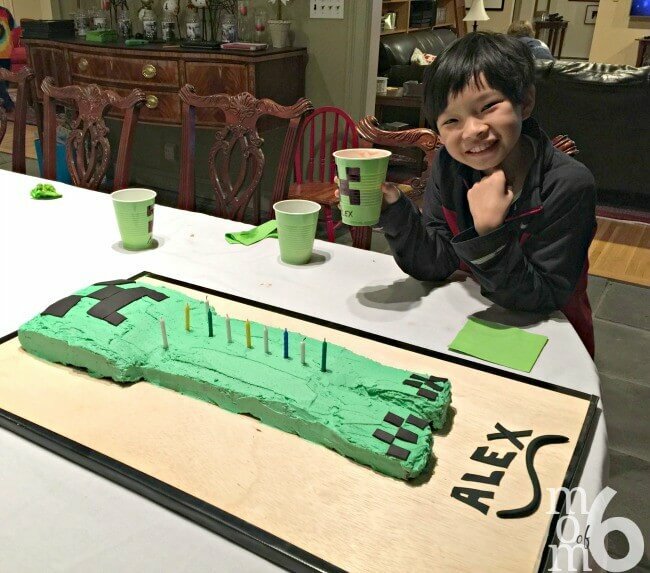 Here's where other cake decorators get fancy… they pipe on green icing in multiple shades to achieve the pixelated look of Minecraft Creepers- and if you have time for that- then awesome! But since my goal is to complete the cake in under an hour, I simply use my favorite homemade icing recipe (see below), tint it using green gel coloring, and give the top of the cake and then the sides a good coating. If it looks good and there aren't a ton of crumbs peeking out through the icing I'll stop there, but if it needs another “coat” on top of the “crumb coat” then I will walk away, allow the icing to harden a bit for an hour and then give it another thin layer so the green icing is all that you see! Personally- I adore fondant, and if I would love this cake even more if I decorated the entire cake in fondant- but that would add a lot more time to the job! So to keep things simple, I only purchased black fondant, rolled it out to a thin sheet, and using a small sharp knife, cut out the blocks to make Creeper's face and feet. And also used it to write my son's name down on the bottom of the board! This icing has the best flavor ever! Cream shortening, flavors, and milk in a mixing bowl. Add powdered sugar and meringue powder and beat until light and fluffy. Note: you can purchase clear (colorless) vanilla extract, butter flavoring and almond extract here from Wilton. You can also order the meringue powder here. My guy was pretty excited about his cake! 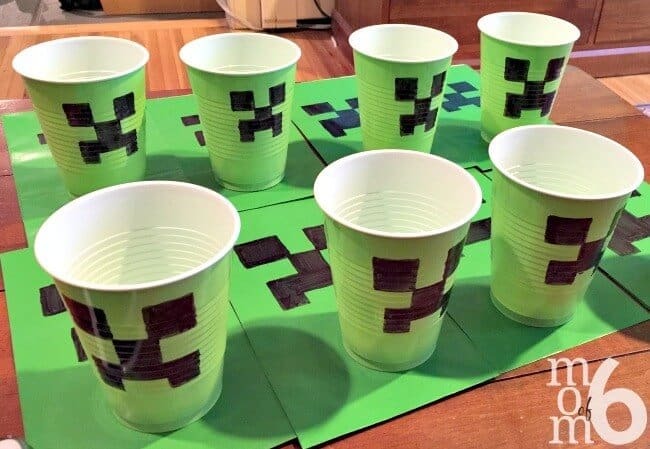 Another simple idea we had was to purchase green plastic cups and green paper bags and add on the Creeper faces using a Sharpie! 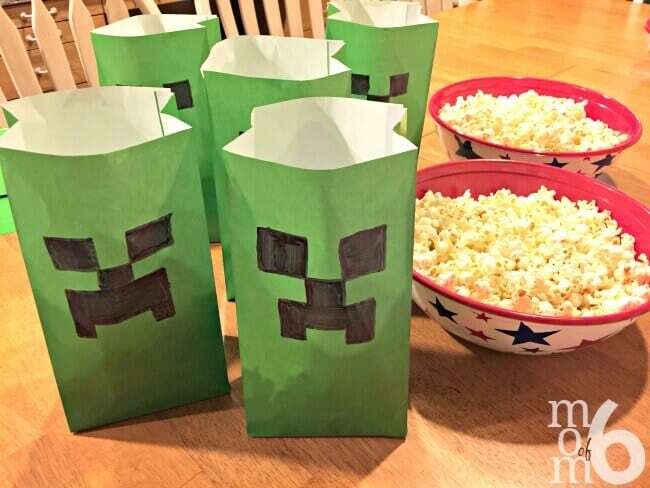 The bags were for holding popcorn- which the kids snacked on later in the evening when they watched a movie (did I mention that my son elected to have a sleepover party?)! 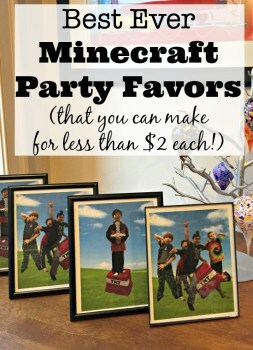 Perhaps you saw my post on How to Make an Awesome Minecraft Party favor- for less than $2 each? If not- you should check it out! 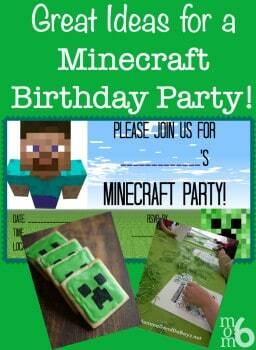 And if you are looking for more great ideas for a Minecraft Party- check out this post too! 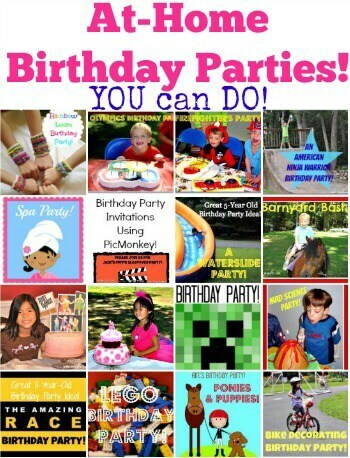 My blog is packed with ideas for fun birthday parties you can host at home! *Please note that some of the links above are affiliate links, which means I will make a small commission if you purchase through these links. It’s a great way to support a blogger!